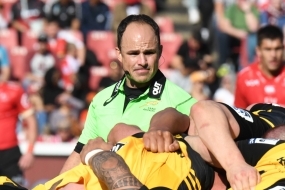 After refereeing the Currie Cup Final at Newlands on Saturday, Jaco Peyper is to have another do-or-die match on Tuesday, the promotion/relegation in Bloemfontein between the Free State and the South Western Districts Eagles. It is a vital match for the two teams as it determines their status for 2019, either as a Currie Cup team or in Division 1. The difference is great. Free State have "qualified" for this match by becoming last in Premier Division of the 2018 Currie Cup, South Western Districts by winning Division 1. Last year the match was between Griquas and the Griffons in Kimberley, which Griquas won 59-26. Free State have been playing in two competitions, their "better" side in PRO14, the other team in the Currie Cup. The Free State Currie Cup team lost all six of their Currie Cup matches, but South Western Districts will play the "better" team on Tuesday. Peyper, who was the excellent referee in the final, will be refereeing home match as he is a Bloemfonteiner, but then he has done this often enough before. His main assistant is AJ Jacobs of Welkom. He was an assistant referee for the Currie Cup Final on Saturday's. Ben Crouse of the Blue Bulls and JJ Wagner of Griquas are the other two officials.